2014 Circuit Benders’ Ball: Call for Participants! 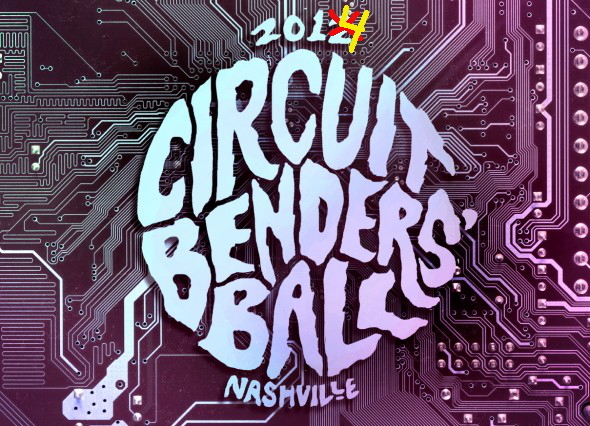 The 2014 Circuit Benders’ Ball is now accepting submissions! We’re looking for performers, live visual accompanists, multimedia artists, workshop instructors and speakers. The entry deadline is Sunday, February 9th at 11:59 p.m. To submit, fill out this short form. The Circuit Benders’ Ball is a biennial celebration of hardware hacking, art, music and the creative spirit. The event will take place at Fort Houston in Nashville, TN on Saturday, April 12th, 2014. The Ball will feature (at least) two stages, ten or more performers, an interactive art gallery and electronic workshops. Learn more about the 2010 Circuit Bender’s Ball here and the 2012 Ball here. The submissions will be reviewed by a panel of judges, including myself, Geo Leonard, Josh Gumiela, Megan Kelly, and Stephen Zerne. We want the Ball to be a safe and welcoming environment for everyone, and we’re working on drafting a strong anti-harassment policy (and subsequent staff training) to ensure that all performers and attendees feel safe and comfortable. We’re also doing everything we can to make sure the call goes out to a wider audience than just our social networks. Our previous CBBs were over-representative in straight white cisgender male performers, and we intend to work harder this year at recruiting more women, people of color, people with disabilities and people who are gay, bisexual, asexual, intersex or transgender. This doesn’t mean we’re discriminating against straight white dudes or selecting performers based on any of these characteristics. Rather, we’re attempting to confront implicit biases in ourselves and in the selection process that could discriminate against people with these or other characteristics. Here are some guidelines on what we are looking for. 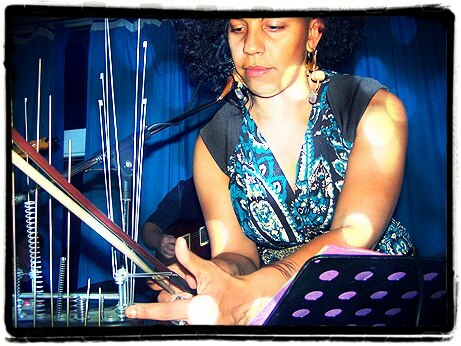 Performances should somehow involve circuit bending, instrument design or creative coding. You need not have built the machines yourself. Although experimental / non-rhythmic is our main focus, we’re also open to other genres. We’re also open to multimedia performances, dance, theatre, projection mapping and whatever you can dream up! One of the most talked-about aspects of the previous CBBs was the pairing of performers with visual artists. If you’re a filmmaker, lighting designer, or artist of any stripe, you can collaborate with a performer to mastermind a beautiful audio/visual synthesis. We’re looking for art to display in the CBB gallery. Art can be 2D, 3D, sculpture, interactive, film/video or installations. In keeping with the theme, the art should have an electronic or mechanical element. We love interactive devices that make light and/or sound! You can also show off some of your circuit-bent gear! For this year’s ball, we’re looking for simple, inexpensive workshops. For that reason, all workshops will cost $15 and last 1 hour and 15 minutes. Workshop teachers get $12.75 per student. Fort Houston gets the remainder. All materials and teacher fees must come out of the $12.75 per student. The challenge for the teachers is to pick a topic that doesn’t use expensive materials and doesn’t take longer than an hour and 15 minutes from start to finish. Examples of low cost workshops include paper circuits, paper automata and introductory courses to programs like PureData and Supercollider. Keeping the class time short means we can program more workshops. Keeping the costs low means we can attract more students. Workshop teachers must source all materials, except for materials provided by Fort Houston and the students. We would love to add panel and presentations to this year’s event! Lead a discussion or join someone else’s. Towards a Circuit Bending Standardization: This panel explores developing a technical standard for circuit bending interface and controller design. Such a standard could benefit designers who aim to sell their innovative devices while making it easier for artists to assemble a fully interconnectable arsenal of circuit bent instruments without any electronics expertise. The Circuit Benders’ Ball is a non-profit event created to educate, inspire, and connect. Soon, we’ll launch a Kickstarter campaign to help finance the event. All Kickstarter donations and ticket sales (after expenses) go to the artists, on a sliding scale, based on distance from Nashville. The farther you have to travel, the bigger piece of the pie you get. We may agree to a set guarantee for featured artist, to be decided. The more we make, the more the artists make. Not a dime goes to me or anyone on the organizing staff. More details coming soon. Apply to the Ball with this short form. The entry deadline is Sunday, February 9th at 11:59 p.m. In fairness to everyone, we won’t start assembling a lineup until the deadline has passed. Once we’ve assembled a lineup (approximately February 15th), we’ll seek confirmation with the artists we’ve picked. When everyone is confirmed, we’ll notify the artists who were not selected and then announce the lineup publicly. See you in April! The 2014 Nashville Circuit Benders’ Ball Has a Date: April 12th @ Fort Houston! It’s my pleasure to announce the date and location for the 2014 Nashville Circuit Benders’ Ball. The biennial daylong festival celebrating hardware hacking, art, music and the creative spirit will take place at Fort Houston on Saturday, April 12th, 2014. The 2012 Ball took place at Brick Factory, Fort Houston’s previous location and moniker, and we’re pleased to be partnering with them again. 2010 and 2012 art directors Megan Kelley and Stephen Zerne return for 2014. 2012 participant Josh Gumiela and Brighton, England noise artist and promoter Geo Leonard will chair the event with me. We’re working hard preparing the CBB website, call for artists, Kickstarter campaign and more. Stay tuned to Theatre Intangible for more Ball announcements in the coming weeks! Instrument-maker, circuit-bender, ambient musician and one of the coolest people on the planet Tim Kaiser is returning to Noa Noa on Saturday, June 29th for a very special performance. He’ll be in the area for the Louisville Experimental Festival. We’re very fortunate that he agreed to make a stop in Nashville. You NEED to be at this show. I know I say that a lot, but seriously. This time. NEED. Tim Kaiser is well known in the atmospheric experimental music scene for his blending of acousto-electric contraptions and Frankenstein electronics to create ethereal, layered drones. His sonic landscapes have been called “experiments in adventurous art” and “eclectic genius” by the likes of Make Magazine, Wired, the New Art Examiner and the Associated Press. Mr. Kaiser was featured on the PBS program MakeTV and has headlined numerous experimental music festivals in the US. Dylan Simon & Amy Blackburn Simon will blend voice, synthesizer, and hurdy gurdy into a tapestry-gilded gateway to the dream world. 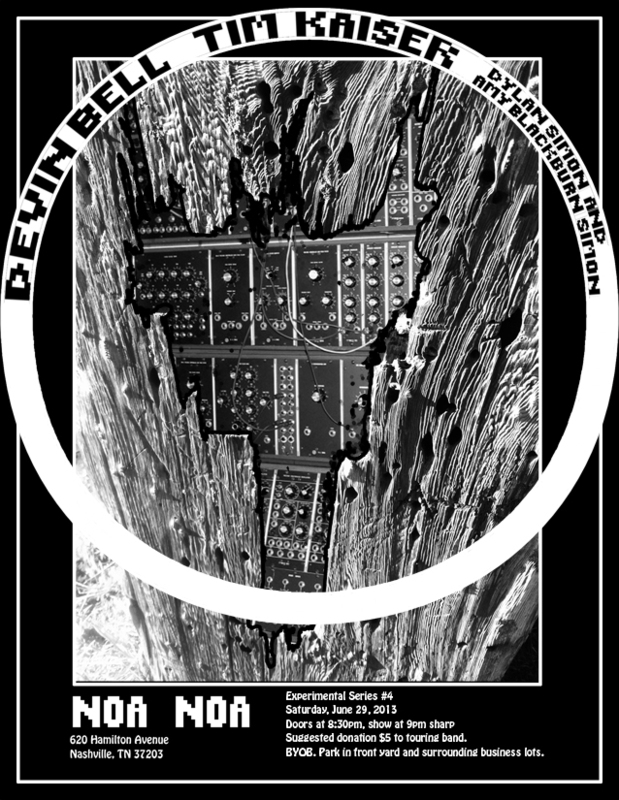 Devin Bell (Blight Side of Life) will harness the power of audience smart phones and use them as multi-channel speakers in which to broadcast his circuit-bent drone set. That’s right, your phones are the speakers! Incidentally, all three acts are Circuit Benders’ Ball alums. More info on the Facebook event page. Don’t miss this very special show! Suggested donation $7 to $10 to touring band. The Fuse Factory, a Columbus, Ohio based nonprofit arts organization, recently launched a Kickstarter for their 2013 Frequency Fridays season. You might know them as the organizers of the 2012 Columbus Circuit Benders’ Ball. Their latest Kickstarter campaign will go towards bringing cutting edge experimental artists to Columbus, including 2012 Nashville Circuit Benders’ Ball participants Roth Mobot. Fuse Factory is an incredible organization that should serve as a role model for all hackerspaces and media arts labs. When we organized the 2013 Circuit Benders’ Ball, we used their previous Kickstarters as models. Please consider donating, and if you find yourself in Columbus, check out the events!